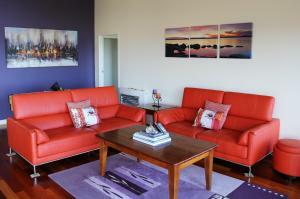 Waves, a property with a tennis court, is located in Coles Bay, 10 km from Wineglass Beach. Guests benefit from a terrace and a barbecue. The holiday home comes with 3 separate bedrooms, 2 bathrooms, a fully equipped kitchen with a dining area, and a flat-screen TV. Guests at the holiday home can enjoy golfing nearby, or make the most of the garden. When would you like to stay at Waves ? This holiday home has a balcony, electric kettle and kitchen. Each day we'll check prices and send you an email for your selected dates at Waves. If you don't have specific dates but would like to check prices for say next weekend or say next month we can check the price too. Click to write a review and share your experience of Waves with other travellers.